The upside of rehabbing Turkey Vultures is they’re smart, funny, cool, fascinating birds. The downside is sometimes they’ll bite you and throw up on you. This gorgeous guy was hit by a car, I’m guessing, in a town south of me. He hobbled into the driveway of a woman named Terry, limping badly and unable to fly. She made the 10 or 14 calls it usually takes to find a wildlife rehabilitator, finally finding me. She was not only compassionate and determined, but intrepid: I told her she needed to contain the vulture so I wouldn’t get all the way to her house and find him gone, and she somehow managed to get him into an empty garbage can. I arrived, she pointed to a small storage area of her house, and to a garbage can with a heavy board across the top of it. I removed the board, and found a full-grown, very annoyed-looking vulture. He tried to employ his vulture defense mechanism and heave a load of vulture vomit at me, but mercifully his stomach was empty, and he shot a blank. As I carried him to the car I looked into a towering pine tree across the street, and at least 30 of his friends and family looked back at me. “He won’t be gone for long!” I called, with determined optimism. There was nothing broken, he was just very sore. Vultures tend to get hit by cars, since they go for roadkill, are not very agile, and have poor eyesight. He stayed with me for three weeks, resting and healing. When he felt better he moved from his hospital crate to my outside flight, where he could stretch his wings and not have to suffer the indignity of being picked up and moved each day for crate cleaning. Terry’s neighbors, Ray and Veronica, tracked me down through my website, asked how he was doing, and sent a donation to help for his care. When it came time to bring him back to his home all three of his fans wanted to be there, but something came up at the last minute for Terry. The vulture and I arrived with my son, daughter and two friends in tow. His vulture friends weren’t in the pine tree, but I was sure he’d know where to find them. I lobbed him into the air, and he landed on the ground. #@^%! I thought. But he was just scoping the area. He took a few running steps, and sailed off into the air. 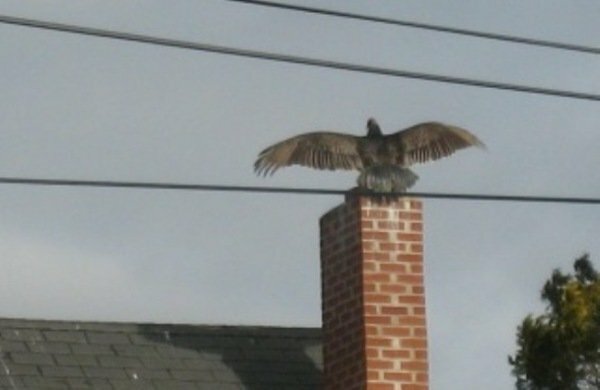 He landed on a roof, hopped onto a chimney, and spread his wings, as if welcoming himself back. Suzie Gilbert is a licensed wild bird rehabilitator whose shameful secret is that on one occasion (well … maybe more than one) she has received a little brown job, or a fledgling whatever, and has been completely unable to ID it. Luckily, she has birder friends who will rush to her aid, although she must then suffer their mockery. She runs Flyaway, Inc. out of her home, and has been caring for injured and orphaned wild birds for 20 years. Why go birding when you can just stroll through the house? Honestly, though, she is wildly envious of birders and their trips to exotic locales. She is the author of Flyaway, her bird-rehabbing memoir, and Hawk Hill, a children's book, and is the sole parent of two teenagers. Never a dull moment. This is awesome, Suzie. I doubt I could exhibit such steely resolve in the face of a vulture’s defense mechanism! 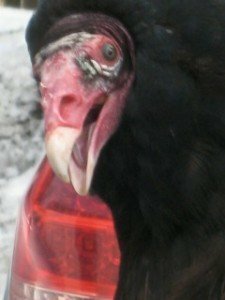 Is vulture vomit really that bad? I’ve heard about it before, and I might be working with them next week…what’s the smell like exactly, and how hard is it to wash out? Suzie, you are the coolest! And I hope you don’t mind me saying, one of my heroes! Thanks for all you do and thank you for writing Flyaway! How Did the Prothonotary Warbler Get Its Name?